Dark Souls 2 will be released on PC April 25, Bandai Namco has confirmed. The date was announced on the game’s official Facebook page. The date correlates with the release date posted last week via an advert posted on Siliconera. As for console, and while supplies last, pre-ordering the game will net folks the Black Armour Edition – containing an Exclusive Metal Case, the Original Game Soundtrack and an early access to the Black Armour Weapon Set. If pre-ordered on Steam, customers will get a digital soundtrack and the early access to the Black Armour Weapon Set, the Official Dark Souls 2 Artbook in PDF format and The complete Dark Souls 2 Digital Comic Book written by Rob Williams and Andi Ewington with art provided by Simon Coleby. To celebrate the PC announcement, Namco has released a prologue trailer. It’s below. 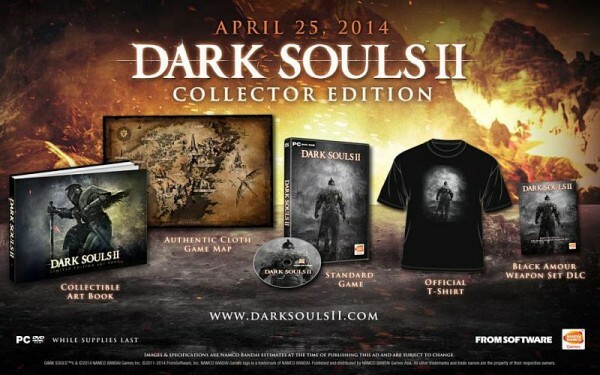 Dark Souls 2 launches in North America March 11 and across Europe on March 14 on PlayStation 3 and Xbox 360.